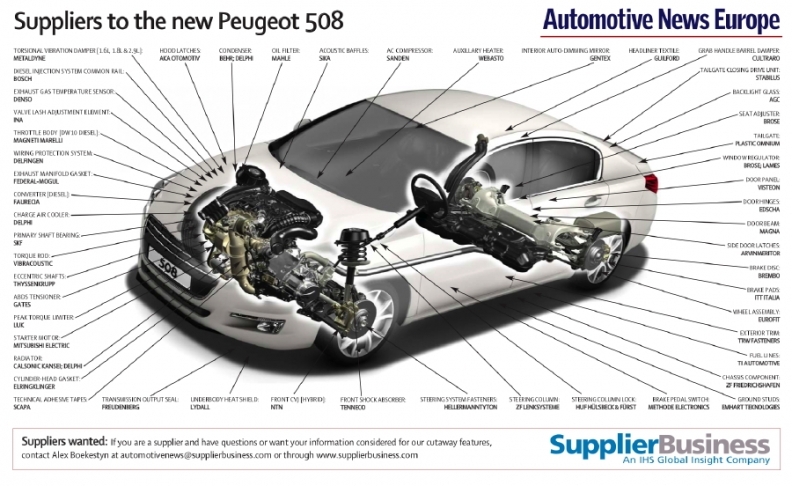 Faurecia SA supplies a number of components to the new Peugeot 508, including the complete seating structure for the vehicle. The front seats have new curved head restraints with integral multi-position adjustment that have been shaped to take into account the effects of rear collision, including whiplash. The French partsmaker, which is controlled by Peugeot's parent, PSA/Peugeot-Citroen SA, has also been involved in the styling of the nose of the vehicle, supplying the front bumper to the car. This feature is designed with floating grille effect, created by the chrome rim encircling the grille. The feature also includes an engine cooling system supplied by Faurecia, which is enhanced by controlled air intake flaps which helps Peugeot reduce CO2 emissions in the range. The range begins with the e-HDI 1.6-liter diesel model, which has CO2 emissions of 109 grams per kilometer. The company also supplies the instrument panel and center console. Robert Bosch GmbH supplies the 508 with a number of key parts, including the parking aid system, the wiper systems and the control unit and injection valves on the gasoline engine. The 508, which succeeds both the 407 and 607 as Peugeot's mid- to large-sized offering, is one of the first PSA models to offer a diesel-electric hybrid powertrain in 2011. It joins the 3008 and the Citroen DS5. IHS Automotive forecasts that Peugeot will build 126,372 units of the 508 in 2011, before ramping up production to 141,000 in 2012 and 2013. The model will be sold at a premium to cover the cost of the hybrid technology, so volumes should remain relatively low. The model will also be launched in China in mid-2011, with local production expected to reach 65,000 by the end of the year.